Dimensions (W x H x D): 3.54" x 2.13" x 1.02"
This electronic preamplifier stands up to the test and will provide you with serious sound performance. 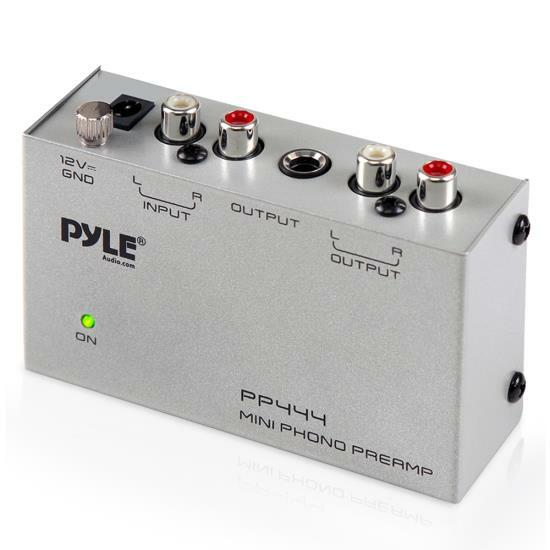 The PP444 is perfect for bringing your studio equipment's phono-level output to a more suitable line-level output. It'll take your audio signal, amplify its strength and prepare it for further processing by your receiver or amplifier. Preamps technically provide voltage gain to your desired equipment and are key to assisting the signal source, whether it's a turntable, musical instrument or microphone. The ultra-low noise audio conditioning circuitry allows the preamp to boost audio to levels that are more manageable for various types of audio equipment. You'll find it easier to adjust the recording level volumes of different sources from microphones and instruments alike. You should position your preamp close to the source to reduce unwanted noise and interference. Preamps can sometimes come built into the stereo equipment, but if that's not the case, the PP444 is an easy install, wise choice and great addition to any musician or producer. Take your sounds and audio production skills to the next level with the PP444 Preamplifier. There is no power switch, is the unit always on, or does it time out if no signal is input? On the unit I just purchased it appears to be always on. what is the 1/4 inch for? RE: PP444 - Do I connect a ground wire between the PP444 and turntable or between the PP444 and AV receiver? Thank you. Only if your phono has a ground wire already. What is the gain on a PP444 phono pre-amp? It amplifies the magnetic phono signal to a aux in line level signal. Check my instructions below for repair or to get a replacement unit. If you are still within 30 days of the initial purchase date, you may still be eligible for retail exchange. Before continuing with your warranty claim, contact the retailer you have purchased the item through and check on your purchase's eligibility for direct exchange. This will be the quickest way for us to get a new and working unit in your hands. If an item is not eligible for retail exchange but it is still within a year of the initial purchase, Sound Around USA will cover repair or exchange costs for products with a manufacturer defect. 3) Print and fill in the requested information. You should expect a 2 week turnaround time for processing warranty claims. Please note, if your item is out of warranty, it can still be repaired but you will be responsible for costs of the repair. Please check the packet for payment details for out of warranty items. Let me know if you have any questions regarding our warranty process.